An artist trip to North Berwick beach popped up on my Facebook memories recently. 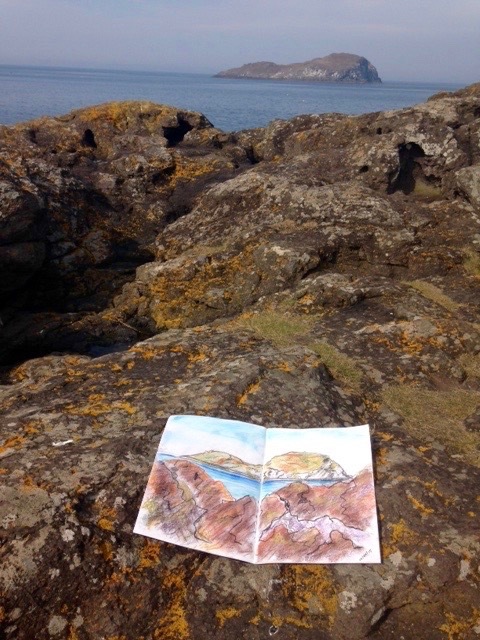 And now that it’s looking like spring I can’t wait to draw the sea and sky, the islands of the Forth. Growing up I would see Bass Rock every day, so the beach is close to my heart. 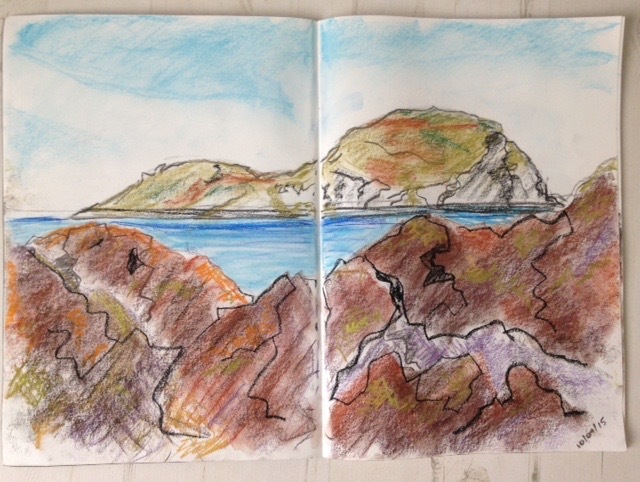 Along with Fife coast opposite, so close you can almost touch it on a clear sunny day, the islands make an interesting composition as a quick practice sketch or full-blown painting. Since they change shape as you move along the beach, you can fill a sketchbook with many different works. Additionally, the coastal light can change in the blink of an eye, casting shadows across the contours of the islands. And the rocks on the shore itself are beautifully textured and multi-coloured. Coastal jewels! There are few places on the planet I’d sooner be than capturing the jagged coastline and big skies. 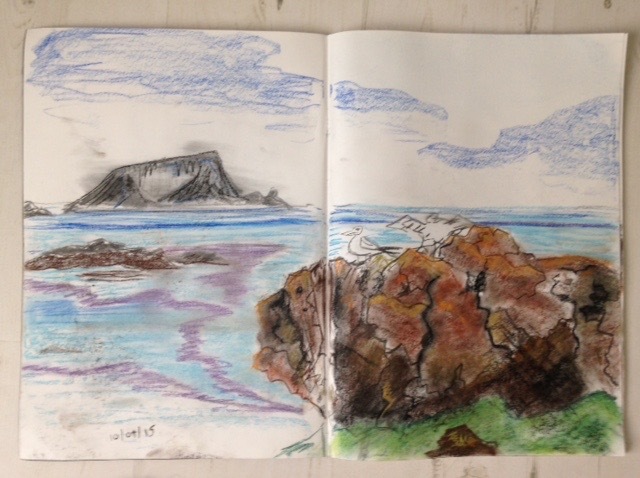 And North Berwick beach is a perfect sketchbook destination for me. Once my hometown, I now live a mere hour and half away on the train. So if a fine day beckons on the east coast, I pack my pastels and pieces* and go. Like many other local artists, I love drawing the islands with their changing outlines from different aspects of the beach. The one above is Craigleith which always reminds me of a creature in repose. The outer islands seem to be seen from their very best advantage from North Berwick beach. It’s as if Ye Gods have had a hand and arranged them to be seen to their best advantage from the town. No wonder it’s become so popular to live here! The islands of the Forth are Fidra, the Lamb, Craigleith and the Bass Rock. They lie no more than three miles/five km out in the Forth. Of all of them it’s the Bass you may have heard of. It’s a port of call for seabirds in summer when the rock turns white with their droppings. In winter it’s a deep grey as all the Bass’ seasonal visitors have made for warmer climes. Fidra, a bit closer to Dirleton but still very much viewable from North Berwick, is said to be the inspiration for Robert Louis Stevenson’s Treasure Island. And did you know that Mr. Stevenson himself was the odd one out in a family of lighthouse builders? Their handiwork rings the Scottish coast, saving many a life at sea. Meanwhile, the Lamb was snapped up by Yuri Geller as he believes it has magical significance. Did I mention my broken collarbone when I did these? I did these sketches ten days after my operation when my right arm was in a sling in April 2015. Two days before my birthday that year, I finally underwent surgery to repair a fractured clavicle. Sustained when I went flying off my bicycle on a trip to Millport island in the Firth of Clyde some seven months earlier. It was a glorious spring day and perfect for a late birthday celebration. I was recovering from a general anaesthetic, sitting at home unable to do much for myself. Meanwhile a clear blue sky and sparkling sea were waiting in the wings. Bearing in mind the surgeon’s words that I should keep my arm and shoulder mobile, I hopped on the train. Considering my broken collarbone, yes. And I’m happy that I chose chalk pastels. They’re very forgiving if you make a mistake, plus inject that bit of instant colour into my work. I’m happiest with the Bass Rock one above as it’s less deliberate and messier. I don’t even mind the smudges from not spraying my work afterwards. However, I can see that I finished the two further up the page in a hurry. I wanted to start a new picture, hence slapped those black lines in to break up the rocks in the foreground. But they don’t really tell the viewer anything – other than I wanted to finish the sketch! It doesn’t describe the texture of the rocks as I’m sure pastels could if I’d taken more time.I can certainly blame my injury for that as I was getting uncomfortable. 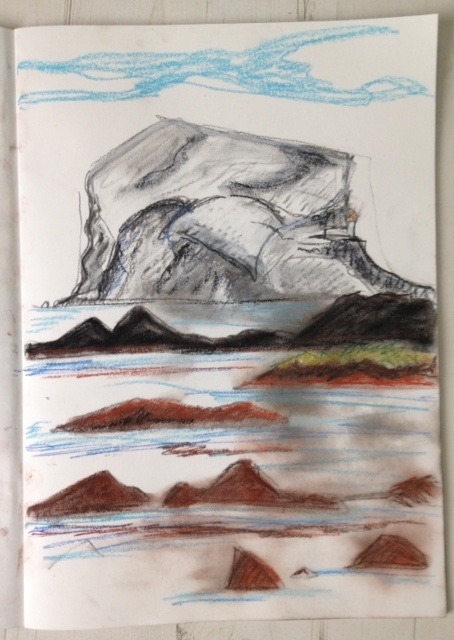 That said, I have captured the shapes of the islands and can be confident of returning to them when I need studies for a painting. By this time I was seriously wondering if I was about hear a PING!!! as the metal bar I now have in my body came apart, so this really was the last piece I was going to do. 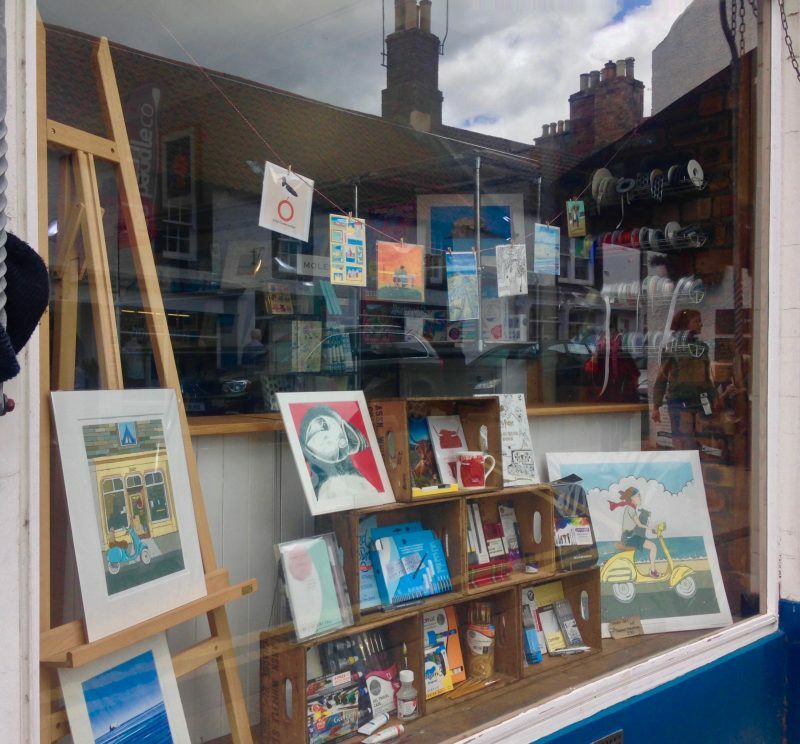 Pop into Rock and Bird on the High Street for a fab selection of art materials, work by local artists and gifts. I remember this shop fondly as it was a sweetie shop when I was a child, run by the parents of a classmate. Nowadays the candy bars have been exchanged for pastel ones. So many things have changed in this lovely town since I was a bairn. But North Berwick beach is always the same and welcomes me “home”. ** Disclaimer No 1: In no way do I recommend sketching as a physiotherapy exercise for recovering bones, at least not ten days after surgery. I took the utmost care, plus understood my limitations. "Turning 50: How I spent my big day"
"A kimono inspired dress from old fabric"